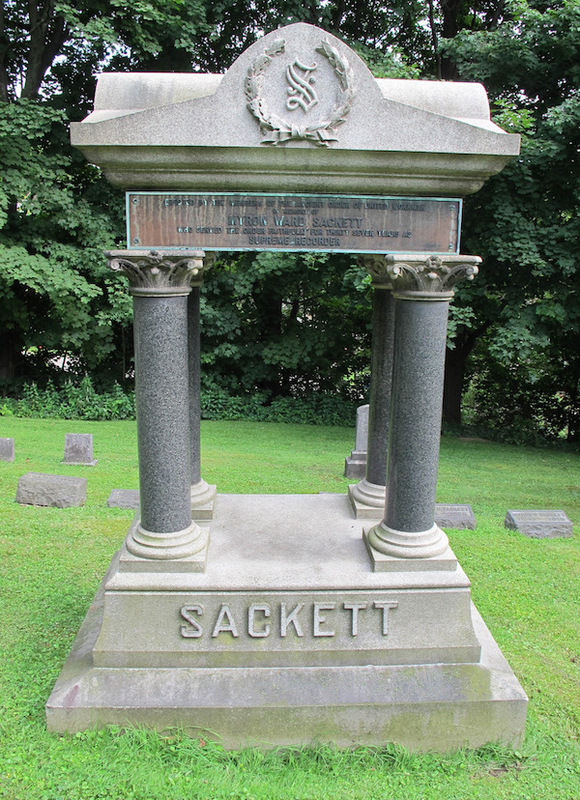 After an early start in a clothing business with his half-brother E W Tanner, trading as Sackett & Tanner, Myron Sackett became involved in the Ancient Order of United Workmen to which he devoted the rest of his career, rising to become its general secretary or Supreme Recorder. 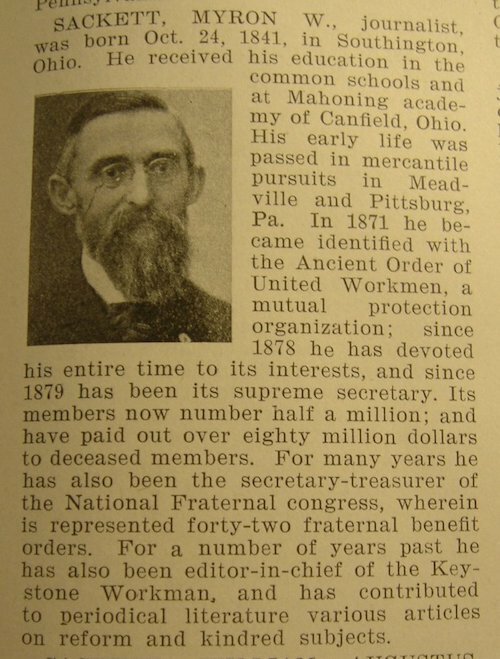 He served also as secretary of the National Fraternal Congress and was editor-in-chief of the Keystone Workman. Stones to side are inscribed "… V Sackett …–1926"; "Myron W Sackett 1841–1916"
Charles Weygant, The Sacketts of America, "6570. Myron Ward Sackett, b. in 1841; m. Sarah Varian Barber." "Pennsylvania Death Certificates 1906–1966", digital image, Ancestry.com, "Sackett, Myron Ward, d. Liberty St, Meadville, Crawford County, Pennsylvania, 12 Jan 1916, married, b. Ohio, 24 Oct 1842, age 73-2-19, occ. Supreme Recorder AOUW, father Ward E Sackett b. America, mother Fid[e]lia Turner b. America, informant Edgar Sackett, Meadville, cause cerebral hemorrhage, bur. Greendale, 15 Jan 1916." Index of Interments, Greendale Cemetery, Crawford County, Pennsylvania, LDS film, "Sackett, Myron Ward, buried 15 January 1916, age 72 years, 2 months, 19 days, section 4 of lot 69." Index of Interments, Greendale Cemetery, Crawford County, Pennsylvania, LDS film, "Sackett, Sarah V, buried 13 Sep 1925, age 80 years, 10 months, 3 days, section 4 of lot 69." Sacket, Miron W, 8, b. OH. Website Library of Congress, Chronicling America: Historic American Newspapers (http://archive.org), The Mahoning Dispatch, Canfield, Ohio, 2 Apr 1915. Coyle, Frank, 18, clerk crockery store, b. PA.
Susan Barber, mother-in-law, widow, 74, b. England, father b. England, mother b. England. Barber, Cordelia, sister-in-law, b. Feb 1840, 60, single, b. PaA, father b. NY, mother b. England. Hartison, Margaret, servant, 48, divorced, 5 ch, 4 living, b. PA, father b. PA, mother b. PA, domestic, private family. 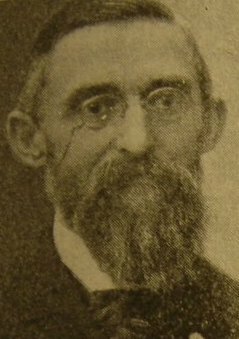 "US City Directories, 1822-1995", digital image, Ancestry.com, Meadville City Directory, 1905, "Sackett, Myron W (Sarah V) Supreme Recorder AOUW 902 Diamond sq. h 883 Liberty"; 1912, "Sackett, Myron W (Sarah V) supreme recorder AOUW 244 Arch, h 883 Liberty." Website Library of Congress, Chronicling America: Historic American Newspapers (http://archive.org), The Mahoning Dispatch, Canfield, Ohio, 13 Aug 1915, 18 Aug 1916. "US Passport Applications, 1795–1925", digital image, Ancestry.com, "Crawford County, Pennsylvania. Sarah Varian Sackett, not now married, widow of Myron Ward Sackett, a native born citizen of US. Sarah b. at Meadville, PA, 7 Nov 1844. Myron b. Trumbull County, OH. Sarah resident at Meadville and retired. Visiting Cuba and Lesser Antilles and British Guiana. Object health. Intending to leave from New York or Florida port on about 30 Dec 1918. Sworn 12 Dec 1918."